Korea is not a large country by any means but its cuisine, cooking method, and preferential tastes in food can often differ greatly by region. I say this because I didn't realize until a few years ago that my preferential tastes in Korean food is largely North Korean. My grandparents on my mother's side all hailed from the Gaesong and Pyongyang region so the cooking that was passed down to my mother was mostly a derivative of that. It's strange because even before I knew of my linkage to the north, some of my favorite dishes since childhood have been dishes that are popular in these northern regions including naengmyeon, mandu, bindaeddeok, and such. My preference in seasoning in Korean dishes is also akin to the preferences of there as I prefer lighter seasonings that allow the ingredients to shine instead of relying heavily on thick and extra bold sauces and seasonings like in the Jeolla and Gyeongsang regions down south. To get a taste of these Northern style of Korean cuisine in Seoul there's a number of decades-old famed North Korean cuisine establishments scattered around the capital, especially around the older neighborhoods north of the Han river. These are often second or third generation owned restaurants that were first started up by families from the north who fled south during the Korean war. One of these very famed joints is Pyeongraeok (평래옥) which I'm introducing in this post today. Pyeongraeok was started over 60 years ago by a family who came down from the Pyongyang region during the early days of the Korean War. The restaurant, in the old neighborhood of Euljiro, has since become an institution with long lines not uncommon during lunch/dinner hours on both weekdays and weekends. Everything on the menu here is all made in the traditions of the north and, specifically, Pyongyang style with many popular Pyongyang cuisine dishes on the menu. You have your naengmyeon, bibim naengmyeon, and ohnmyeon (온면) (each 8,000 won) while their yook gae jang, gukbap and ddeok manduguk are all 7,000 won. These are very inexpensive prices compared to other famed Pyongyang eateries in Seoul where I've seen naengmyeon alone at places go for as much as 13,000 to 14,000 a bowl. Meat dishes include the Pyongyang-style steamed boiled meat platter (58,000 for a large portion and 35,000 for a small portion) and bulgogi. The bulgogi can be ordered made with either Australian beef or Korean beef with a one person/200g portion going for 14,000 and 30,000 won respectively. Also on the menu are other Pyongyang favorites including nokdoo jijim (녹두지짐이), aka nokdoo bindaeddeok for 9,000, handmade steamed dumplings for 7,000 and Pyeongraeok's arguably most famed dish- chogyetang (초계탕) for 11,000 (with a minimum order of two servings required). Chogyetang is a chilled noodle and chicken dish which is more associated with the north. The word 'cho' or '초' is the Chinese character derived character for 'vinegar' (which is is why the Korean word for vinegar is 'sikcho' or 식초') while the word for 'gye' or '계' is the word for 'chicken', and 'tang' or '탕' is soup. So literally it means vinegar chicken soup. It's a very uncommon dish in South Korea and is usually only found in either North Korean cuisine-based restaurants or in the eastern Gangwon regions. At Pyeongraeok, their chogyetang is what draws one of the biggest buzz, and crowds, which is what I went with on my visit along with their mung bean pancake (nokdoo jijim or 녹두지짐) and handmade dumpling (jjim mandu or 찜만두). The restaurant is a two-story building but if you come during the middle of lunch or dinner time, expect to wait. I came at 11:30 AM on a Wednesday to try and beat the crowd and although we averted having to wait in line, the restaurant was already PACKED and we managed to grab one of the last remaining tables on the second floor. The menu is posted on the wall for folks to see. They also make it a point to share that their rice and lettuce are all from Korea and that the kimch is made in-house. Side dishes are pretty basic with things like simple radish kimchi, sprouts, kimchi and such. In true North Korean nengmyeon fashion, kettles of hot beef broth (yooksu or 육수) is provided to help stimulate the taste buds before the cold noodles arrive. If you're only getting the less expensive dishes the chicken muchim is generally not provided but can be ordered for a full shared serving at 17,000 won. So you can imagine why most go for the big orders here to get the chicken muchim on the side for a better value. The nokdoo jijim (mung bean pancake) is always made fresh to order and comes piping hot on a plate straight from the pan. For 9,000 won you will get two giant-sized mung bean pancakes which are brimming with pieces of pork, green onion, and other veggies and goodies. Having that North Korean root in me, I have always, always loved mung bean pancakes and Pyeongraeok does theirs justice. The cakes are thick but with just a right batter-to-filling ratio and cooked just right so it doesn't fall apart. With a quick dip in the soy sauce-based dipping sauce on the side, this hearty pancake goes great with the cold, crisp flavors and tastes of nengmyeong or chogyetang. Their jjin mandu is priced at 7,000 won for six large, child fist-sized dumplings. Right off the bat you can tell even the dumpling skin is handmade as the dumplings are crudely shaped together unlike the clean cut, factory made ones you get at many other eateries. But you can't judge a mandu by its appearance and if you cut through the mandu you will find a glorious mixture of minced pork, leeks, onions, diced kimchi and other amazing things which really packs a flavor punch in your mouth. The combination of different flavors and textures will have you "ooh"ing and "ahh"ing inside your head (maybe even out loud) and you may even find yourself fighting over the last dumplings with your group as the number of these glorious stuffed morsels dwindle down. Please note- you can get a half and half order of the dumplings and bindaeddeok which will bring out three dumplings and one bindaeddeok. The highlight of the meal, the chogyetang arrived and at first our eyes bogged at the sheer size of the chogyetang; it constituted of an enormous glass bowl of chewy noodles and broth, topped with sliced radish kimchi, cucumbers, pickled greens and boiled and shredded chicken meat. Between the three of us, we had initially thought to order three servings of the chogyetang but our waitress adamantly insisted that two would be more than enough and boy, were we smart to listen to her. As soon as the dish set down, the waitress gave everything a good mix with the tong and ladle. From here, you can serve yourself into individual bowls while mustard, sugar, vinegar and such are on hand on the side to adapt to your taste- just like nengmyeon. As simple as the dish looks, the broth is a complex one which combines meat and vegetable stock along with dongchimi broth and other goodness which is chilled to the point right before it freezes. Take a big chopsticks worth of noodles, veggies, and chicken and proceed to enjoy the different textures and flavors before washing it down with a gulp of the delicious chilled broth. It has just a slight tart kick but also has lots of umami flavors and just a tad of sweetness. The chewy nengmyeon noodles have just a bit of bite to hold up against the crunchy pickled vegetables while the boiled chicken pieces are just right between tender and firm and with no gamy smell. The broth is a little less sweet than other chogyetangs at other places which is great for me but the beauty of this dish is that it can be customized with the provided side condiments to your entire group. I can't stress enough though that at least a bit of the mustard sauce should be added to give your chogyetang just a bit of that "oomph"! Get in bites of the dumplings and nokdoo jijimee in between and your meal will be that much more golden. We walked out with extremely stuffed stomachs and in admiration of not only the meal we just had but how great the value was for the portions too. The best thing is how beautifully all the dishes complemented each other during the meal which some may find ironic considering how there's so many contrasts going on (hot vs cold, noodle soup vs hearty pancakes, etc). But the paradoxical pairing of things that seem polar opposites often coming together in harmonious ways in Korean food is part of the beauty of Korean cuisine. Service at Pyeongraeok, like most busy institutions, is gruff but just remind yourself an old saying at busy places like these- "The squeaky wheel gets the oil." The food at Pyeongraeok does not disappoint and I definitely understood why it has attracted throngs of hungry patrons for decades now. It's also a great place to visit for those who are familiar with Korean cuisine but looking for something a bit unique. Sure, North Korean flavors and cuisine may seem blander to the fiery, pungent, and/or often red dishes of the south but take a deeper look between the initial tastes and you will find the flavors of the north are an exercise in harmony; the focus is not on an immediate impact on your tongue but letting your taste buds work to enjoy the flavors of the different ingredients inside and letting them shine. It's a great way to try out some North Korean food at affordable prices, not to mention the food is quite excellent. Head out Euljiro 3-ga Station's exit 11 but immediately turn around once you come out of the exit and follow the left curving corner which should be right in front of you. Walk down the road for about 100 meters (the road's name is "supyeo-ro" or "수표로"). You'll know you're heading down the right road if the large street signs for drivers point the direction you're walking as being towards Twegyero 2-ga and the Jungbu Police Station. Along the way you'll also pass by a Gong Cha (bubble tea shop). You'll eventually come to a major four-way intersection. 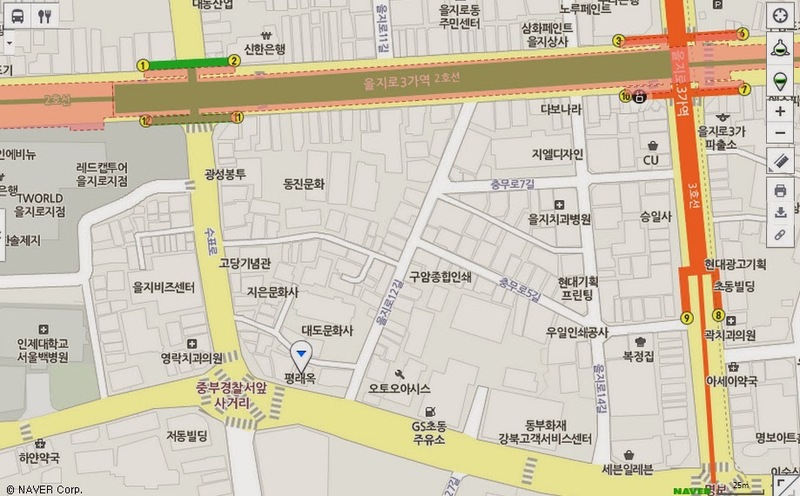 Turn left and walk about 30-50 meters and you'll see Pyeongraeok on your left. Alcohol: Your standard Korean soju, beer, makgeolli and such all available. Tip: Arguably two of the most famous dishes at Pyeongraeok are the chogyetang and the spicy sweet chicken muchim. As I mentioned above, the chogyetang is a minimum order of two, however the spicy sweet chicken muchim is provided free of charge on the side which makes it a great way to taste both. The chogyetang is also HUGE in serving so if you're ordering other dishes too, there's definitely no need to order as many servings of the chogyetang as the number in your group. You can get a half and half order of the dumplings and bindaeddeok which will bring out three dumplings and one bindaeddeok. If you want to skip the lines, try and go a little earlier or later than the standard lunch and dinner times! Pyeongraeok is closed on Sundays. It's also closed on weekdays afternoons from 3:30 to 5 PM to prepare for dinner.